You remember the total solar eclipse in August, right? And you remember how in the days before it, we were told not to look at the sun, again and again, so many times in fact that we began to doubt it? Some of you might have even had enough hubris to peek. And while you're probably all right, not everyone's so lucky. A new study in JAMA Ophthalmology details exactly what happened to a person who stared into the eclipse. According to the report, a 26-year-old woman named Nia Payne glanced at the sun while it was 70% obscured while she was walking around on New York's Staten Island during the eclipse. 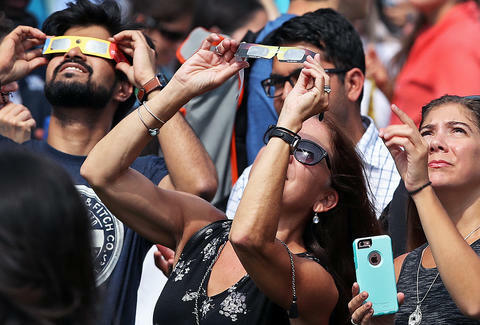 She proceeded to borrow a pair of eclipse glasses from a stranger to peer into the sun for 15 to 20 more seconds, but it's suspected now that those glasses were fake, as she said the sun still looked pretty bright. That's maybe the worst part of this: She thought she was being cautious, but soon lost vision in her left eye. Two days later, Payne went to the emergency room with a black spot in the center of her vision. The emergency room referred her to Mount Sinai's New York Eye and Ear Infirmary, where she was asked to illustrate the spot and drew the shape of the sun during the eclipse, i.e., a circle with a chunk missing. Mount Sinai's doctors scanned her retinas and found damage resembling the same crescent shape as her blind spot and the eclipse itself. According to the Washington Post, this is called solar retinopathy, and it's the result of the sun actually burning your retina, which sounds absolutely terrible. "So far, it's a nightmare, and sometimes it makes me very sad when I close my eyes and see it," Payne said in a report by CNN. "It's embarrassing. People will assume I was just one of those people who stared blankly at the sun or didn't check the person with the glasses. It's something I have to live with for the rest of my life. But it could be a whole lot worse, and I try to count my blessings." The moral of the story: Please make sure you get eclipse glasses from a reputable distributor. Oh, and don't ever look at the sun -- during an eclipse or not -- without proper protection. James Chrisman is a News Writer at Thrillist who worships the sun. Send news tips to news@thrillist.com and follow him on Twitter @james_chrisman2.